If there were some way I could have my RSS reader synch with the remote OPML file, that would reduce a lot of the overhead. Tom – I couldn’t agree more. To me, this seems a very obvious and useful requirement. I am staggered that none of the RSS readers support it. Good news guys, there *is* a Feed Aggregator that does this – BlogBridge.com. With BlogBridge you manage collections of feeds known as Guides and you can choose to publish your guide as a Reading List. A Reading List is nothing more than a dynamic feed list which means the collection of feeds is expected to change at any time. Whenever I change the list of feeds in that Guide all I have to do is re-sync or have it re-sync automatically and the OPML changes accordingly. As regards OPML autodiscovery, yes, it’s difficult to see reasons for doing that right now but, as with RSS autodiscovery, we’ll see more and more reasons as time goes on. It’s all part of the bootstrap for the ecosystem. Now that the likes of Tom Morris OPML Ping Server can track the growing universe of OPML we could expect to see OPML spiders launching soon. Recntly added the same to my own set of blogs after picking up a few emails from James – http://www.kenmc.com/kenmc.opml. 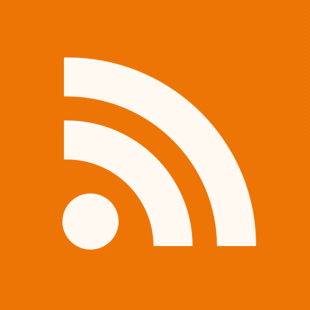 Provides a great way to promote reading of all my other blogs by using the sidebar grazr. Quite a handy one indeed! Couple remarks. Shouldn’t the type attribute be “text/x-opml”? Shouldn’t you have a text attribute? I keep my published set of feeds in a specific folder in FeedDemon. When I modify that list, I export that folder to a public OPML file. Then I use my OPML blogroll widget for WordPress to publish the list on my web page. The widget also adds an auto-discovery link. I’ve mentioned to Nick Bradbury that it would be nice if you could auto-sync a folder to an OPML file, or just have FeedDemon manage that folder in an external OPML file. That hasn’t happened yet. So far the only feedreader I’ve found that does not require saving an OPML file to something like opmlworkstation.com is newsgator. 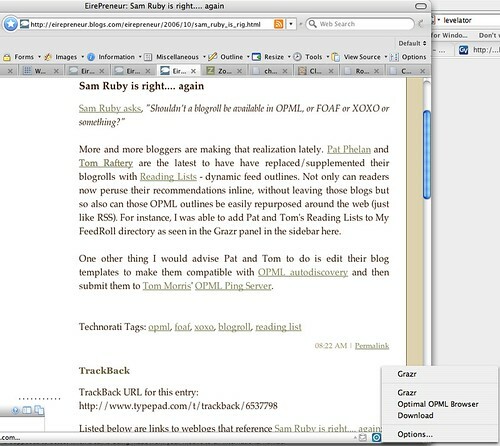 In newsgator, one’s reading list stays updated at a URL at which one can point grazr or bitty browser. Should it be Randy? Tom Morris says it should be text/xml opml and since I’m not much of a programmer myself I’ll leave you two debate it. Agreed though that there should be a Text attribute. It was sheer laziness on my part for leaving it out. The “Reading List” icon in my blog’s sidebar links to my Bloglines OPML, which stays current automatically. Can you guide me to Tom Morris, so that I can correct at the source? Thanks! like James, I too am not a programmer, I simply copied the code from James’ site and changed the uri. So the Sterling, at least, agrees with you on the x-opml. Don’t know Tom Morris – hopefully James will come back on that one. Tom, my OPML was generated by FeedBurner, so that’s Nick’s opinion on the matter. That said, Nick is usually pretty careful to get these types of things right. Sorry I’ve been a bit lax in responding. In terms of which I’m using – I’m using “text/xml opml” on my sites. I have little time for specifications, but I have a lot of time for working code. I asked a question about this privately a while back to some OPML folk (including Dave Winer) but had no response. I left it up to someone else to work out the details. As for what goes on my site, I will use what is most popular – and I will be extending my code soon to track what type attribute people are using. The library that I am writing at the moment based on what I’m using at changes.opiumfield.com (which you guys should ping!) should accept all different varieties. I’m not sure whether it should be my responsibility to tell you what The Standard is. In fact, I think the person who could probably help us come to a consensus is Dave Winer – he has a lot of experience in ratifying these sorts of argument – a minefield I’d rather avoid. According to the OPML 1.0 specification, there is no requirement on MIME type. There is a convention, based on what Radio UserLand did, to use “text/x-opml”. The convention for using “text/opml xml” is based on the way that other XML formats have done – “xsl xml”, “xhtml xml” etc. As for Randy’s suggestion of using a ‘text’ attribute – surely a ‘title’ right? Hey Tom, I added my OPML to your site (cool browser, BTW). Unfortunately, FeedDemon always sets the title to “FeedDemon Subscriptions”. In my previous comment, I meant “FeedDemon”, not “FeedBurner”. Thanks, Sterling. Oh, and in my comments where it says “xml opml” and so on, it really is a ‘plus’ sign between the two parts. See the Wikipedia article “XML and MIME” for examples. The problem we have is that though “x-opml” is stated in the OPML 1.0 specification, the registration of MIME types is something that is really rather complex. RFC 4288 specifies that XML standards ought to use a plus-xml naming, and strongly discourages names that are prefaced “x-“. According to RFC 4288, the opml-plus-xml naming is better than x-opml. I’m also of that opinion, since it follows the precedent laid out by RSS, Atom and other XML formats. It is also possible for tools in the future to just look for plus-xml names in order to find XML of every variety. As I’ve said before, I’m not in the business of setting standards – I’m in the business of building tools. My personal preference is towards opml-plus-xml because of the precedent of previous XML formats. Any tools I build will support both, and until there is a clear determination of which will stick, it is highly advisable for other toolmakers to do similarly. What works and what’s proper are two different things; text/x-opml works and text/opml xml doesn’t. Screw standard bodies. You tell me when http://www.google.com validates.